Yangsi Rinpoche, Wisdom of 21st Century Life Series, Sunday, May 12, 2019. 11am to 3pm. Buddhism is ultimately about skillful means, how to create a stable happiness for oneself and all other beings amidst the existential minefield of modern life. It can’t be reduced to a list of rules to follow, or a formula. It begins with making friends with our own mind, becoming more aware of the landscape of sense consciousnesses, feelings, emotions, observing our response strategies non-judgmentally, and being open to change. Having a wise and compassionate teacher to guide us can make all the difference. This event is open to the public and suitable to people of all backgrounds from “brand new to Buddhism” to experienced student. (Please also consider viewing the first part of this series in this video from April 7, 2019). Schedule: 11am to Noon (Meditation and Talk). Noon (approx). Vegetarian potluck lunch (all invited), 130pm to 3pm, closing session. Yangsi Rinpoche, President of Maitripa College and DFF’s spiritual guide is a fully qualified teacher, having completed the traditional course of study in Buddhist philosophy for over twenty years. Dharma Friendship Foundation is a non-profit with a financial goal to break-even on events. All are welcome at any level of donation, from virtuous intentions if you are short of funds to $50 if you are able to be sponsor someone else attending. Suggested donation reflects our expected attendance and hosting costs for teachers. For this event we suggest a donation of $25 per person.. You can donate directly on our website or at the event. Pre-registration and payment is appreciated! 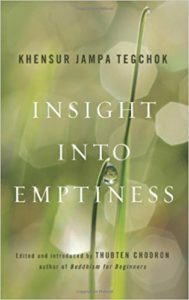 This ongoing monthly class, led by senior students of DFF, will explore the profound Buddhist teachings on emptiness, using the textbook, “Insight Into Emptiness”, by Khensur Jampa Tegchok as our guide. This book, written in clear English (edited by Venerable Thubten Chodron) is available by Wisdom Publications here. or on Amazon. Our April meeting will discuss Chapter 18, The Two Truths. Time: 9:30am to 11:00am at 2109 31st Ave. S., Seattle, WA. Some prior understanding of basic Buddhist concepts such as karma, the four noble truths, the altruistic intention (bodhicitta) will be helpful as a foundation, but not a prerequisite. Yangsi Rinpoche on 12/9/2018 in Bellevue, WA. February 4, 2018. 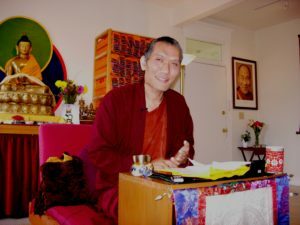 Yangsi Rinpoche. Teachings on Emptiness. (Visit our Audio file – Resources page to listen). On December 5, 2017, Yangsi Rinpoche gave a teaching on how to respond skillfully to the current negativity in the U.S. political climate, as well as adverse events in general. One of his students wrote this blog summarizing his comments and the thoughts of community members. Click here to read. Audio file: Click here. Green Tara retreat with Yangsi Rinpoche. March 18-19, 2017. DFFers gathered at the home of Steve and Pam on the eastside and completed two days of auspicious Dharma retreat practice with Rinpoche. May the merits from this blessed practice radiate out in all directions and immediately remove obstacles to enlightenment for infinite sentient beings! Check out the photos below: Om Tare Tuttare Ture Soha. 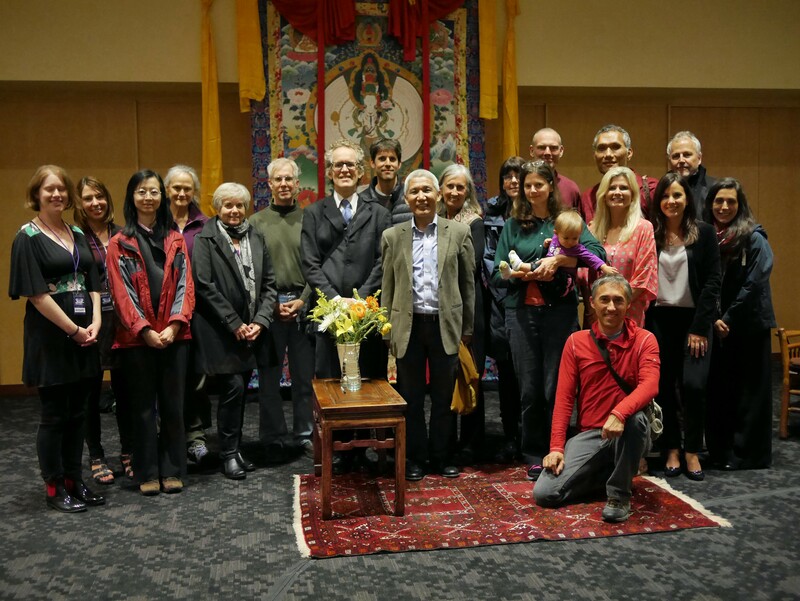 Thank you Jan Willis, and to everyone who came to Kane Hall on Tuesday, May 23, 2017, for her inspiring talk on “Dharma and Activism”. Watch the video on YouTube. For those who missed this event (October 15, 2015 at Seattle Public Library) here are the videos: Note that it may take some time for your computer to download the file before it will play without interruption. December 4, 2015. Scientists and spiritual leaders both agree that our world is profoundly interconnected. The well-being of every individual, and the environment as a whole are all interdependent. How do we create and sustain spiritual community? 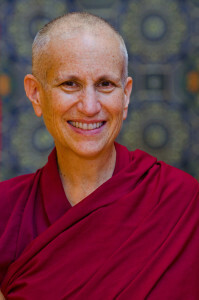 Venerable Thubten Chodron, Abbess, author, and Buddhist nun for nearly 40 years, will share stories and insights on this topic in an evening talk you won’t want to miss. This program is offered free of charge. There will be a donation basket for those who wish to support these teachings. View/listen to this teaching on YouTube. Speaking generally, Buddha taught two wings of awakening – wisdom and compassion. While the wisdom aspect, embodied by the practice of mindfulness, has been enthusiastically adopted in the west by the clinical health professions, and corporate leadership training programs alike, compassion has been relegated to a lesser role, perceived as too religious, too emotional, and possibly a sign of weakness in our hyper competitive culture. Geshe Thupten Jinpa, through engaging stories, humor, scientific data, and offering personal reflections, inspired a capacity crowd of 400 at Kane Hall to confront our cultural biases towards compassion, and to consider that the first person to benefit through the practice of compassion is oneself. Thank you to our precious teacher, Yangsi Rinpoche, for inviting Geshe Jinpa and physically bringing him to Seattle, caring for every detail of his itinerary and bringing the exquisitely beautiful Chenresig thangka. Thank you to Lauren Updyke and Margaret Murray of Whole U for answering and sending hundreds of emails and texts as we worked out the many interdependent aspects of the venue setup, and schedule. Thank you to Pam Cowan for loaning the beautiful furniture for the stage. Thank you to Dr. Liliana Lengua and Dr. Bonnie Duran of UW for organizing the reception for faculty and local Dharma practitioners. And thank you to everyone who helped in countless other ways, and who came and listened and are now working on attaining realizations. May our practice of compassion alleviate the sufferings of infinite beings who transmigrate endlessly through the realms of samsara. May all these beings quickly awaken and be freed. 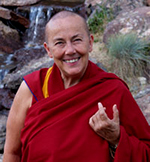 Look for the video link to Geshe Jinpa’s teaching in our next e-blast. Dharma Friendship Foundation is under the spiritual guidance of Yangsi Rinpoche, President of Maitripa College. All are welcome! Dharma Friendship Foundation is a non-profit, 501(c)3, volunteer-run organization. Unless otherwise noted, all events take place by donation only. No one is turned away due to inability to pay. We are funded primarily through the generosity of our contributors and monthly supporters, and by dana (donations) given for teachings. Location of events may vary; please check details with each event announcement.